Vatican City, Aug 8, 2018 / 04:37 am (CNA/EWTN News).- Attachment to idols is a failure to trust totally in God – and to reject them, Catholics must accept their weaknesses, inviting Christ to heal their hearts, Pope Francis said Wednesday. 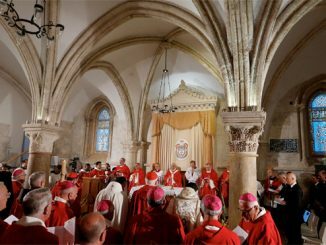 Healing from the attachment to idols comes from Jesus Christ, “who became poor, who accepted failure, who took our precariousness to the end to fill it with love and strength,” the pope said Aug. 8. For his weekly general audience, Pope Francis spoke on what he called the “very important” topic of idols, begun the previous week, and part of a larger series of catechesis on the Ten Commandments. His catechesis reflected on a passage from the Book of Exodus, in which the Israelites, who were awaiting the return of Moses from the mountain where he would receive the Ten Commandments, fashioned a golden calf and began worshipping it as a god. He said the image of the desert represents the uncertainty and lack of guarantee found in human life and noted that the anxiety of life’s unpredictability, or feeling God is not present, can lead people to cling to false, or “custom-made” gods, like the Israelites did with the golden calf. “He comes to reveal to us the fatherhood of God; in Christ our fragility is no longer a curse, but a place of encounter with the Father and the source of a new strength from above,” he said. 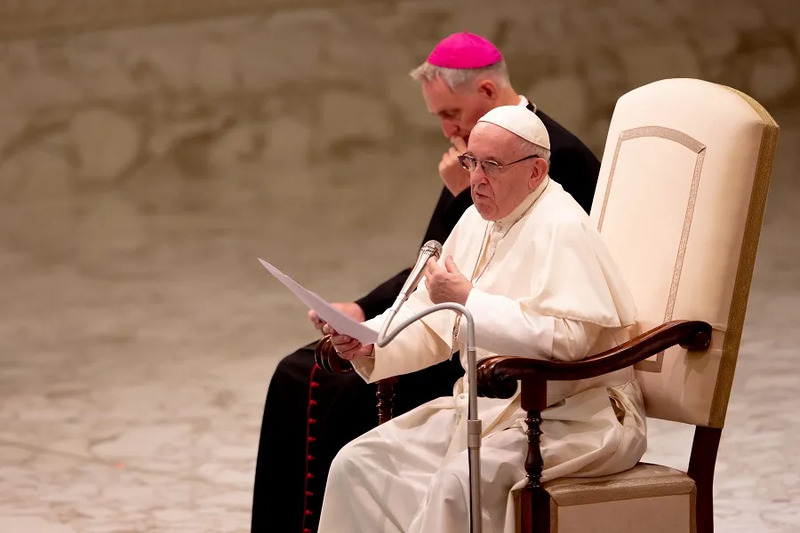 Vatican City, Apr 10, 2019 / 03:49 am (CNA).- Pope Francis warned Wednesday that pride is the most dangerous attitude in the Christian life, pointing out that even the holiest of people have received everything from God. “None of us loves God as He loved us. It is enough to put oneself before a crucifix to grasp the disproportion,” Pope Francis said April 10. “Before God we are all sinners,” Francis said. “If we say we are without sin, we deceive ourselves and the truth is not in us,” he said quoting the first epistle of John. “There are glaring sins that make noise, and there are also devious sins, which lurk in the heart without us even realizing it. The worst of these is pride,” Francis said. Pope Francis said that when we go through difficult days, we must always remember that life is a miracle that God has created from nothing. “In this life we ​​have received so much: existence, a father and a mother, friendship, the wonders of creation,” he said. “If you love, it is because someone next to you has awakened you to love, making you understand how in it lies the meaning of existence,” he explained. Pope Francis called this principle the “mystery of the moon,” which has no light of its own, but reflects the light of the sun. The pope said that understanding this can give us a greater empathy for others. Pope Francis reflected on a line, “Forgive us our trespasses” as a part of his ongoing catechesis on the “Our Father” prayer. “Lord, even the holiest among us does not cease to be your debtor. O Father, have pity on us all,” Pope Francis prayed. Vatican City, Aug 6, 2018 / 10:04 am (CNA/EWTN News).- Pope Francis made a private visit Monday morning to pray at the tomb of Bl. Paul VI, on the 40th anniversary of his death. Francis made a similar visit to Bl. Paul VI’s tomb last year. Pope Francis’ visit to the tomb took place in an absolutely private manner, said vice-director of the Holy See press office, Paloma Garcia. 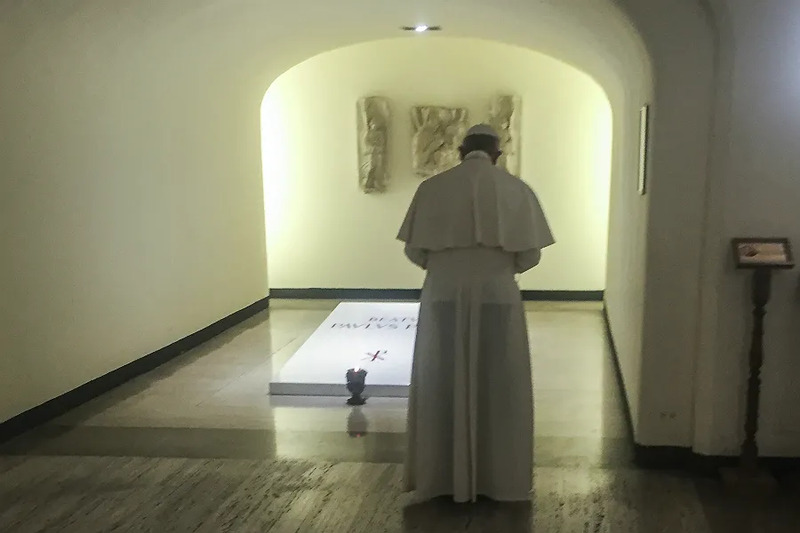 She told EWTN Aug. 6 that Pope Francis prayed for about 10 minutes at the tomb, which is located in the Vatican Grottos, the crypt beneath St. Peter’s Basilica. Bl. Paul VI, to whom Francis referred Sunday as a “pope of modernity,” was the author of the 1968 encyclical Humanae vitae, which reaffirmed Church teaching against contraception. Bl. Paul VI will be canonized with Bl. Oscar Romero Oct. 14, during the synod on young people, faith, and vocational discernment. “From heaven may he intercede for the Church and for peace in the world,” the pope said. Pope Francis unofficially confirmed the news of Paul VI’s canonization during his annual meeting with the priests of Rome Feb. 17. “Paul VI will be a saint this year,” he said Feb. 15. After a long question and answer session, the pope gave texts containing meditations by Bl. Paul VI as a gift to each of the priests. “I saw it and I loved it,” Francis said about the book. Vatican City, Mar 29, 2019 / 08:01 pm (CNA).- President Andrés Manuel López Obrador of Mexico this week wrote to Pope Francis and the King of Spain, Felipe VI, asking for an apology for the conquest of Mexico by Spanish Catholics in the 16th century. His demand for an apology comes at the 500th anniversary of the beginning of the conquest, and the 200th anniversary of Mexico’s independence. “I have sent a letter to the Spanish king [Felipe VI] and another letter to the Pope so that the abuses can be acknowledged and an apology can be made to the indigenous peoples for the violations of what we now call human rights,” López Obrador said in video comments earlier this week. “There were massacres…The so-called conquest was done with the sword and the cross. They raised churches on top of temples,” he said. “The time has come to reconcile but first they should ask forgiveness,” he added. The request generated criticism, and some agreement, in both Spain and Mexico. Sergio Sarmiento, a Mexican columnist, asked why the president was calling for an apology from the people who stayed in Spain, and therefore would not have been a part of the Spanish conquest. Others criticized the president for demanding an apology for a 500 year-old offense. One voice of support for the request came from Ione Belarra, a politician with the far-left Spanish Podemos party, who said on Twitter that it was “very right” to demand an apology for the “abuses” of the conquest. In 1519, Spanish conquistador Hernán Cortés led a small army into the Aztec empire in Mexico, and within two years the Aztecs had fallen under European rule. The conquest led to a great loss of life among the indigenous peoples of Mexico, both in battle and from the introduction of foreign diseases, like smallpox. At the time of Cortés’ arrival in Mexico, the Aztecs were practicing child sacrifice, as well as a ritual in which they pulled the still-pulsing heart out of the chest of sacrificial victims and offered it to the gods, letting the blood spill over the altars and throwing the dead bodies off the steps of the temple. Towers and other structures found in the Aztec empire were also reportedly made entirely human skulls, and anthropologists have also found evidence of a type of ritual cannibalism that took place among the Aztecs. The conquest of the Americas has also been addressed recently by St. John Paul II and Pope Francis. In an address to native peoples during a visit to the United States in 1987, John Paul II acknowledged the pain caused by the encounter of Europeans with Native Americans, which “was an event of such significance and change that it profoundly influences your collective life even today. That encounter was a harsh and painful reality for your peoples. The cultural oppression, the injustices, the disruption of your life and of your traditional societies must be acknowledged,” he said. However, he also defended the positive aspects of the work of the “many missionaries who strenuously defended the rights of the original inhabitants of this land,” who established missions and improved education standards while working to preserve the native language. “Above all, they proclaimed the Good News of salvation in our Lord Jesus Christ, an essential part of which is that all men and women are equally children of God and must be respected and loved as such. This Gospel of Jesus Christ is today, and will remain forever, the greatest pride and possession of your people,” he said. In 2015, Pope Francis also addressed the conquest of the Americas, during a meeting with native peoples in Bolivia. He echoed the sentiments of St. John Paul II, asking forgiveness for the sins committed by some Christians at the time, while defending the actions of other Christians at the time, who chose peace over violence. “I say this to you with regret: many grave sins were committed against the native peoples of America in the name of God. My predecessors acknowledged this, CELAM, the Council of Latin American Bishops, has said it, and I too wish to say it. Like Saint John Paul II, I ask that the Church – I repeat what he said – ‘kneel before God and implore forgiveness for the past and present sins of her sons and daughters,’” he said, quoting an address given by John Paul II in the year 2000. “I would also say, and here I wish to be quite clear, as was Saint John Paul II: I humbly ask forgiveness, not only for the offenses of the Church herself, but also for crimes committed against the native peoples during the so-called conquest of America. Together with this request for forgiveness and in order to be just, I also would like us to remember the thousands of priests and bishops who strongly opposed the logic of the sword with the power of the Cross. There was sin, a great deal of it, for which we did not ask pardon. So for this, we ask forgiveness, I ask forgiveness. But here also, where there was sin, great sin, grace abounded through the men and women who defended the rights of indigenous peoples,” he said. The Vatican has yet to officially respond to López Obrador’s recent request for an apology for the conquest of Mexico.